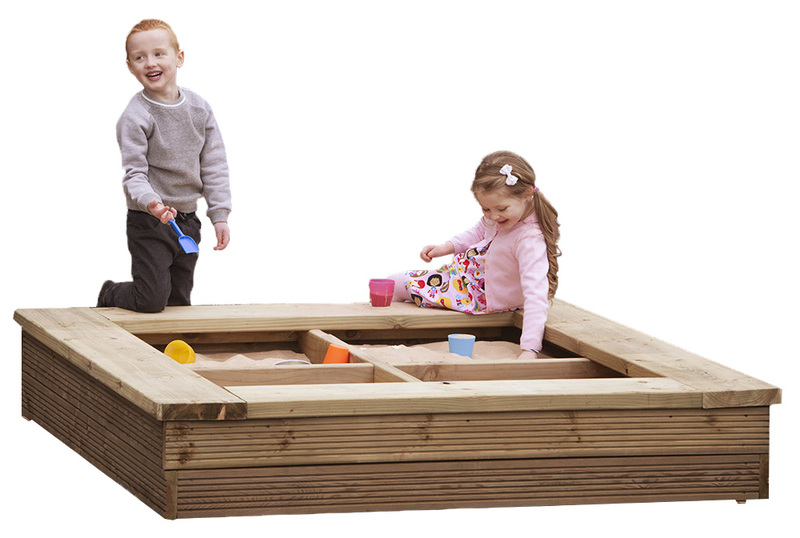 Outdoor wooden sand pit, ideal for nurseries, pre-schools and reception classrooms. Sand play encourages sensory play and helps to promote social skills amongst early years. This seated-height sand pit is manufactured from tanalised pine wood with a natural finish. The high-quality frame of this sand pit makes it durable, sturdy and boasts enough room for outdoor group play. Designed with children in mind, this outdoor sand pit comes with rounded edges for increased safety. Use this 2-in-1 unit as a sand pit or as a large outdoor school planter. The wide surrounding ledge of the sand pit is designed for optimum seating space for children during sand play, or can be used to tend to plants and vegetables. Sand play is a perfect medium for introducing mathematic and scientific concepts to early years. The 4 sections in this unit are ideal for this. Divide each section into a different concept area by providing measuring scoops, magnets and buried treasure and different sized containers. Alternatively to add some colour, add different coloured sand to each section. Sand play helps to promote social skills among early years. When children work together at the sand table they are faced with activities that require sharing, negotiating and compromising. It also helps to improve their co-ordination skills by developing arm and hand muscles. Sand play can be seen as messy play but with easy-clean surfaces, this outdoor sand pit helps to keep mess to a minimum. If you require any further information on the Outdoor Wooden Sand Pit, please contact us or call our sales team on 01733 511121.